JODHPUR, INDIA - 11 FEBRUARY 2015: Indian man by fire at street in Jodhpur, with vehicles and people passing. JODHPUR, INDIA - 11 FEBRUARY 2015: Street doors in Jodhpur, with people and vehicles passing by. JODHPUR, INDIA - 11 FEBRUARY 2015: Vehicles and people passing down the street, with building tower in background. 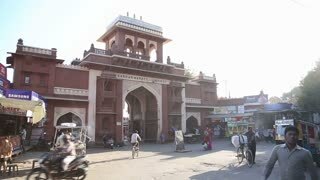 JODHPUR, INDIA - 11 FEBRUARY 2015: Timelapse of people and vehicles passing by the street crossroads in Jodhpur. 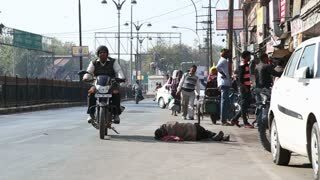 JODHPUR, INDIA - 11 FEBRUARY 2015: Vehicles and people passing by the man sleeping at street in Jodhpur. 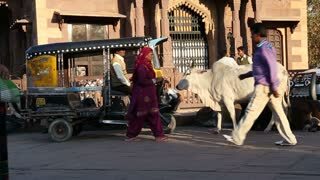 JODHPUR, INDIA - 11 FEBRUARY 2015: People and vehicles passing by the street crossroads in Jodhpur. JODHPUR, INDIA - 11 FEBRUARY 2015: People and vehicles passing down the street, with high tower in background. JODHPUR, INDIA - 11 FEBRUARY 2015: People and vehicles passing down the street in Jodhpur. JODHPUR, INDIA - 11 FEBRUARY 2015: Vehicles and people passing down the busy street in Jodhpur, front view. 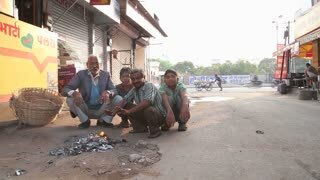 JODHPUR, INDIA - 11 FEBRUARY 2015: Indian men by fire at street in Jodhpur, with vehicles passing in background.